WCA: "Death of George Du Maurier." Source File: cat.nf017.xml From The Home Monthly, 6 (November 1896): 11. Death of George Du Maurier. "Aux nouvelles que j' apporte, Vos beaux yeux vont pleurer." Those are the words from the old French song quoted on the title page of the book that made George du Maurier famous, and they come back to one strangely now at the news of his death. Of du Maurier's life there is little to say; it was quiet and simple and manly as the books he wrote. His mother was an English woman, his father a Frenchman. He was sent to school at Sorbonne where he was for the most part an indifferent student, winning everyone's affection but few scholastic honors. His youth was spent in Paris, his later years in London. He spent most of his life making illustrations for Punch. He never wrote at all until he was past fifty. Then, at the instigation of Henry James, he began Trilby. But the work went on slowly and he felt that he needed some practice before he could handle his theme. In one of those lapses of inspiration he wrote Peter Ibbetson. He had no literary training and the highest value of his work is not a literary one. He had but slight mastery of literary style properly so-called, though he had a most delightful style of his own. The technical construction of his books is by no means perfect, and he had but little of literary craft. He simply wrote out of the fullness of his experience and the greatness of his heart. He wrote not for scholars or men of letters, but for the people. 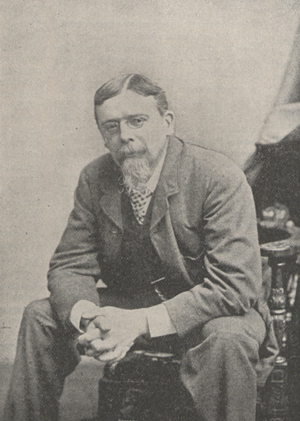 He wrote but three books, only two of which GEORGE DU MAURIER. have yet been published. Did ever a man so win the public by a single effort? He had the best that the world can give, the largest and the sweetest kind of fame: the admiration of trained critics and the love of the great unliterary public that does not analyze, but feels. In a hundred years the man's career will be looked at with frank astonishment, considered as one of the unique things in the history of literature. For his name and work will live; not because he was a perfect master of literary craft, not because his talent was of the colossal all-comprehensive sort, but because his work had in it that undefinable sympathy and tenderness which is perhaps the surest claim upon immortality. For a man's name is perpetuated in the hearts of men rather than in their brain. It has created some wonder that a man who made his debut in literature after he was fifty should do so well in it. But the fundamental training of all the arts is much the same, the observance of actual life and the mastery of artistic effects. From the time he was a scape-grace boy at Sorbonne, du Maurier was one of the followers of that white armless lady in the Louvre, one of her knights-in-waiting, her loyal retainer. He even gave to his "La Svengali" the pose and bearing of that immortal marble woman. With the pencil and the pen, first in one form, then in another, he persued that radiant spirit that is at once the artist's unrest and his great joy. Perhaps he follows it still, beyond our knowledge. "Other heights in other lives, God willing." Fortunately du Maurier lived to complete his last novel, "The Martian," so we will not have a recurrence of Stevenson's untimely death at the beginning of his finest effort. The story began in the October Harpers, and through its opening chapters one feels the same quiet sunny pleasure, the same Indian summer warmth, that made the reading of Trilby so pleasurable. Once again he handles the Paris of the 60's as only he could. Du Maurier certainly did his duty by his American publishers. They made a fortune on Trilby, and now to effectually advertise his new book he conveniently dies. As has been said the chiefest charm of du Maurier's work is not its literary craft, but its human charm. One reads and re-reads Trilby, not so much for the characters of the book as for their genial warm-hearted father, George du Maurier. That is the charm of the book, the wise, gentle, smypathetic personality to whom every sentence brings you closer. Always you feel behind the book the strong, tender personality of a man who has seen much of love and sin and suffering, and has not at all solved the riddle of it all. To read him makes one feel kindly toward the world, and it is worth reading a very long book to feel like that. Whether he was a strictly artistic workman matters very little. He did what art and a faultless style frequently cannot do, he appealed to the human in humanity, and won for himself a place in the hearts and living sympathies of the people. Most of us would write books if we could do that. With his death a strong manly spirit has passed, strong alike against good fortune and evil. He did not profess to have solved the riddle of things. He had no plan whereby to make the world over. He just loved it, selfish, sinning and miserable as it is. We have not had a more kindly and more unpretentious philosophy of life than his. He thought our little breathing time too brief to think unkindly of any one. He felt a comradeship with every man; with youth that hopes, with age that renounces. He had even some tears to spare for the "heavy villain" of this little one act comedy down here. "A little work, a little play To keep us going—and so good day! A little warmth, a little light Of love's bestowing—and so good night! A little fun to match the sorrow Of each day's growing—and so good morrow! A little trust that when we die We reap our sowing! And so good-bye!"